In February 1980, an America dispirited by the Cold War and the Iran Hostage Crisis erupted into a cathartic burst of raw patriotism. A scrappy band of American college kids had defeated the reigning Soviet hockey juggernaut in the immortal “Miracle on Ice.” Amid the spontaneous national celebration, a young Doug Sharp was watching, entranced. He had just been launched on a dual trajectory toward both American military service and Olympic glory. Growing up in northern Michigan, Doug was no stranger to cold and snow. He and his friends began emulating Olympic bobsledders by building up snow so high that they had to use ladders to get to the top. Once at the top they froze the entire course all the way down to the neighbors where they would crash at the finish line. Soon, Doug’s growing love of sports led him to the pole vault. The scholar-athlete’s great strength and speed set him apart in high school and later, at Purdue University, until injuries stalled his Olympic pole vaulting dreams in1996. Doug shifted his focus to a chiropractic career, but his love of sport never waned. Work as a track & field coach for the University of Louisville allowed him to train with his students, and his strength and speed soon returned. From the ashes of his pole vaulting career, he found renewed hope as a bobsledder. Soon, he tuned out the naysayers and trained full-time for a shot at earning a spot on the U.S. Olympic bobsled team. Within a year, the U.S. Olympic hopeful rocketed from bobsledding obscurity to becoming the national champion. Everyone took notice. Even the U.S. Army. 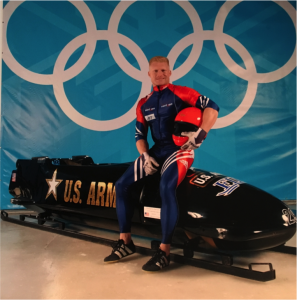 The Army’s World Class Athlete Program (WCAP) emerged as Doug’s third U.S. Olympic opportunity. If he could complete the 16-week artillery OSET Basic Training Program, the Army would teach him to fire the 198 cannons to support units in combat, but would also let him compete for a spot on Team USA. If he failed, the Army would use his talents in other ways. (In the post-9/11 world, business would be booming.) Specialist Sharp earned a spot on the elite WCAP team. Three years later in 2002, Team USA’s confidence was rewarded when Doug helped bring home the bronze medal – a rare accomplishment for U.S. Bobsled. 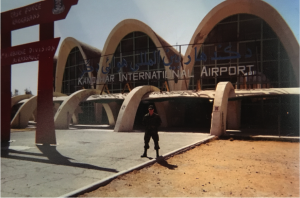 While Specialist Sharp’s patriotism drove him to represent America in the Olympic Games, it also brought him to far-off Kuwait and Afghanistan, which he cites as among the most meaningful experiences of his life. Now Doug is taking on his next challenge; a career transition. After nearly 20 years as a Chiropractor, he is moving into medical sales. The very attributes that made him a successful athlete and doctor will undoubtedly make him successful in any workplace. 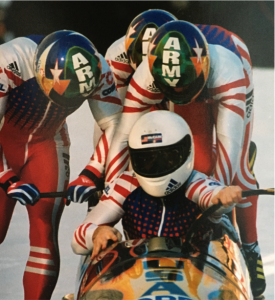 This Independence Day, the perseverance of people like Doug Sharp reinforce my pride in Adecco’s Military Alliance Program, as well as our steadfast support of the Athlete Career & Education Program, and sponsorship of the United States Olympic Committee. Our efforts sustain and support those who sacrifice so much to represent our nation on the field of competition, as well as the field of battle. This July 4th, learn more about the Adecco Military Alliance program. Discover why we’re passionate about American heroes.